Get drainage help in Nashville. 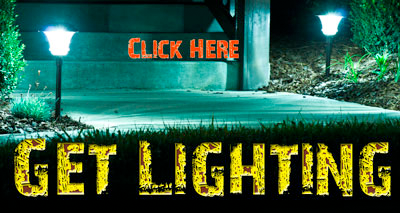 Get landscape lighting in Nashville. Q. Does people mention that you spend too much money and haven’t thought through your purchases? A. What is a good idea today is a good idea tomorrow. This statement has saved me from making many purchases that would have been duds. It always seems like someone else may get there first, so let them have it if it’s soo important to them. You will find a better deal and by better I don’t mean cheaper, or newer. Sometimes a better deal is one that you made after your brain has had some time to think through the ideas. You can really surprise yourself with how much you can learn just by applying a wait rule. Q. Are you surprised each month when your bills arrive at how much more you charged than you thought you had? A. Take a moment and check your account before purchases. This will help you not to over spend and get into that viscous loop of getting fees that you can’t pay. Q. Do you have more equipment in your business than you could ever possibly use? A. Take an inventory of your equipment and supplies. Make a list that you keep in an obvious place so you can add to it and remove items you no longer use. One list should be equipment and another supplies. Every item that needs to be purchased over and over should be listed and now you will be able to plan your purchases. Larger amounts of an item usually mean discounts so check online and at local shops for deals if you buy in bulk. You are going to need those items again and again so why not save money on the larger purchase that you are going to need. In the outdoor business like landscaping and lawn care it is really common to have a back up of everything or two so make sure you have what you need without over buying. Sell the equipment you do not need and use that money to shore up your business in other ways. Q. Do you own every new product that enhances your business before it has time to collect dust on a retailers shelf? A. Those purchases are only good if they will complete your business in a way you are developing toward. An example would be to purchase a GPS device that is mounted on the dashboard so you don’t have to fumble with your phone while driving if you are developing a lawn care business. Q. Do you buy things you didn’t know you wanted until you saw them on display in a store? A. Do your research before purchasing and remember we mentioned taking some time to think it through about whether it is needed. It is important to join organizations where other people in your industry gather because they can shave years off of your learning curve about what you will need and how to structure your business. If you answered yes to yourself any two of the above questions, you are an impulse business supply spender and indulge yourself in equipment purchase therapy. This is not a good thing but there are some ideas related to each question that will help. Following our tips will help you to save for the important things like a house, a new car, a vacation or retirement. You must set some financial goals and resist spending money on items that really don’t matter in the long run but instead to purchase the things you logically need after you had some time to think it over. Impulse business spending will can potentially put a strain on your finances and relationships, as well. To overcome the problem, the first thing to do is learn to separate your needs from your wants and to make lists and compare what you find. Joining organizations where others can give you more input will help you to have the information you need for comparing ideas. Advertisers hit us hawking their products at us 24/7 and some of them are needed. The trick is to give yourself a cooling-off period before you buy anything that you have not planned for, and to really consider the purchase. When you are considering making a business purchase, make a list and take only enough money to pay for what you have planned to buy. If you see something you think you really need, give yourself a couple of days to decide if it is really something you need or something you can easily do without. By following these ideas your business will move forward one day at a time and will become a stable source of income for your family. 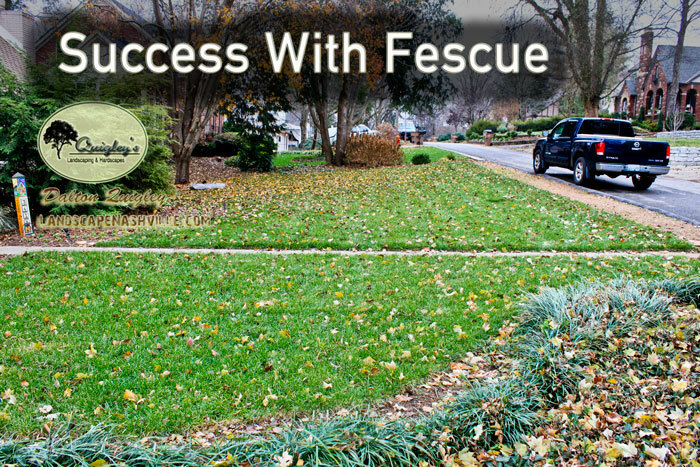 What is the Number 1 thing I need to know to have a successful Fescue lawn? Wow Dalton you must really know something special or why would you put the number 1 thing? Yes I am going to share with you the absolute most important thing you will need to know and have to achieve a fescue lawn. First lets talk about the root system of Fescue grass, well it is spindley and thin and you could compare it to a spider web. If you were to dig up a Fescue plant it would become obvious instantly that this plant must have some sort of way to store nutrients and it just doesn’t seem to be very much in the root system. If we were talking about Bermuda or Zoysia and we dug one plant of each up what you would see are fat heavy thick roots that store carbohydrates and water for leaner times. This storage helps those grasses survive droughts, winter, and when people mow really short for that sculpted look. With nutrients being really important where does fescue store them? Where does Fescue Store Nutrients? Surprisingly lets start with the plants growth habbit. Fescue wants to be 7″ or even 8″ tall and this poses a problem since your local buzybody will have a notice sent to your home to either cut the grass or pay a fine. Ok so lets mow the grass really short for that sculpted look mentioned earlier, slow your roll son fescue has to be mowed at least 4″ tall. Fescue uses its leaves to absorb sun light, breathe through respiration, for water storage, and for nutrient storage. Oh yes you read that right I said water storage. Cutting this type of grass shorter than 4″ depletes the storage of vital water during the drought, is similar to a person having lung surgery, and going on a diet. So why would you invest in seed, aeration, and fertilization or sodding just to choke off everything vital to the plants survival? You wouldn’t if you knew better right? Water is critical to the life of your grass, do you promise to water? You promise you will water? I know people are well intentioned and when it comes to spending money once committed they become even more conscious on having the benefits of a beautiful lawn. When it comes to fescue success I have both seeded and sodded many times over for clients who promise to water. I have driven by later to see how well they were doing during dry times and when clients had trouble. It has been so common for people to promise to water but get busy or just mentally exhausted from dragging the hose around over and over each day that I see many fail. When is the best time to water? Early in the morning. Do you have a couple of hours to spend each morning watering one area for 10 to 15 minutes and then turning the hose off so you can move it to another spot again and again in your work clothes? So like I said most people are well intentioned but cannot live up to watering at the rate that is needed. There is a concept and it is called underwatering, this is when you are busy and water just a bit here and there thinking the lawn will survive, you think you can make the statement that you watered right? No sir / mam underwatering is the same as not watering when it comes to whether the grass lives or dies. So what did we learn? We learned that there is a major factor determining why we someone fails at having a fescue lawn right? And in all of that riggermarole there were the words water storage. Let me tell you that even if you mow to the right height, fertilize, and have the right lighting conditions you can still lose large patches of fescue each year and struggle. So you are wondering what my number one thing you need to know is well here is your answer. You need an irrigation system. No matter how much you promise that you will chase the hose around the yard and be very thorough with watering one thing is for certain. And that is I have had many years of helping clients grow fescue lawns and those have been hundreds so I can speak from clear experience. Whether you install your own system or get one from a professional a sprinkler system that is on a timer, and will water on a set schedule is the single most important thing you can do to achieve a successful fescue lawn. Here is the Number 1 thing you need to know. What should I do about Moss in my Lawn? Posted in Uncategorized | Comments Off on What should I do about Moss in my Lawn? If you have moss growing in your lawn there are only a couple of options that will help. First let me ask does the moss bother you or do you think it is hurting the lawn? Is the moss hurting my lawn? The moss is taking nutrients, and space that your grass plants would otherwise inhabit. If you continue to grow moss you may not be able to establish a lawn in that area. By improving the soil and drainage of an area you can eliminate the proper habitat the moss needs. How does moss start up in a lawn? Moss is a sign of acidity in the soil, poorly draining soils, or an under maintained area where organic matter, shade, and moisture come together in just the right amounts to create a habitat for moss. Perhaps the area was once wooded and had decaying leaves and other matter that made the soil acidic. This is the cause of moss in lawns. Soil PH should be slightly acidic but in order to grow moss it needs to be elevated from that. The acid in the soil does affect your ability to grow healthy grass plants in that area. What can be done to lower the acidity so my grass will grow normally? Way to go for a great answer! We use lime that comes as a powder in bags, it is sold at local nurseries, and garden centers. If you visit one of your local mom and pop garden centers they will be able to guide you as to how to apply the lime. We use a standard sized broadcast spreader. Since the acidity of an area of soil may be deep the treatment may take some time to work down into the dirt to a point where it neutralizes the negative effects of the acid. It is possible for the acid to overcome your efforts with time but if you are patient and keep after it you will eventually defeat the acid in your soil. 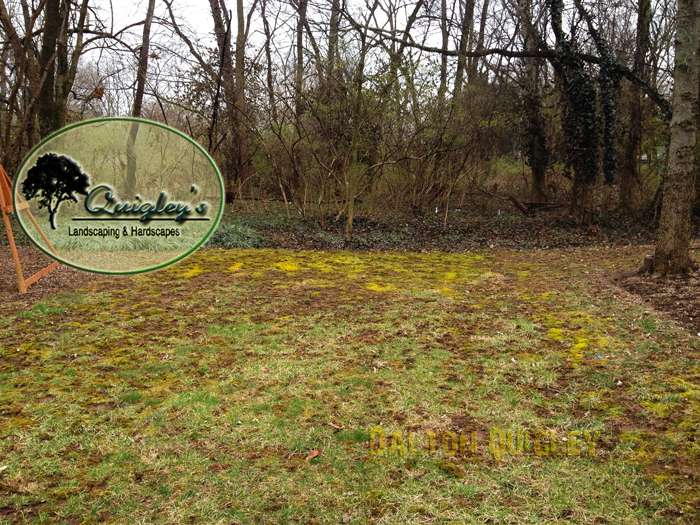 If you need help curing a moss problem in the lawn get in touch with us at Quigley’s Landscaping in the Nashville area at Landscape Company. In Nashville when should pre-emergents be put down in the lawn / turfgrass area? 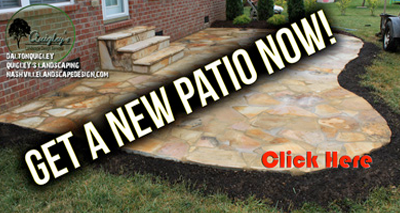 Posted in Uncategorized | Comments Off on In Nashville when should pre-emergents be put down in the lawn / turfgrass area? When should you start using pre-emergents in the lawn to prevent crabgrass? Here is a question I was asked in March of 2014 on a social network. Do you really need pre-emergents in the lawn? Yes you do if you want a lawn that is mostly the type of grass you have paid to have installed in your lawn area. Pre-emergents prevent any seeds that get into the lawn from germinating. It also prevents seeds that are burried and havent grown yet from sprouting so only apply it after your current seeding has completely started growing. The most common way is to hire a spraying company to put your lawn into their schedule for spraying durring the proper times of year. When are you planning to put down pre-emergent? Which product do you use? What type of grass are you growing? 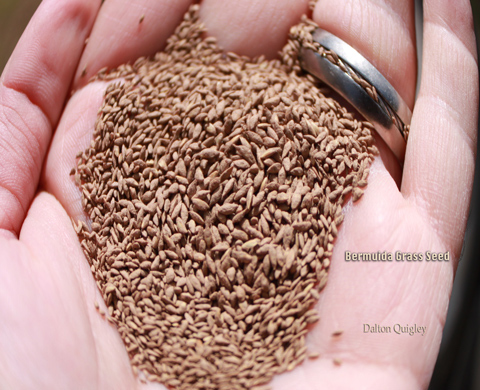 Nashville Bermuda Grass Seed Example, image of a hand holding bermuda seeds ready for seeding a lawn. Whenever spreading seed you should help to hide it from birds by using straw unless you have grass already established. – Extremely difficult to establish. – Tolerates Heat Very well. Full Sun Only! – Winter = Tan to Brown – Don’t have to reseed. – Relatively easy to establish. – Tolerates Heat with Consistent Watering. – Tolerates Some Shade. Evergreen – Have to reseed and should aerate. – Relatively easy to establish. – Less Tolerant of Heat. Tolerates Some Shade. Evergreen – Have to reseed and should aerate. – Very Tolerant of Heat and Drought – Tolerates Some Shade – Never Reseed – Cannot be Seeded has to be Sod or Plugs. – Do not have to Aerate. How do I figure out how much seed to use? The first thing you need to understand is the amount of grass seed you will need is based on how thick your yard already is and the overall square footage by the amount of pounds per square feet for that thickness. The grass you already have is established and will help you to save a little money because you will buy a smaller volume to seed your lawn. So how thick is it? Is it very thick, does it have huge gaps in the grass areas, is it really thin? What is your square footage? Take a measuring tape and measure the length times the width for each major area and add those numbers for a total square footage. With this information you are ready to look up application rates for grass seed for each of the different varieties of turf grasses we grow here in Tennessee. We can help you to have the lawn you are looking for. 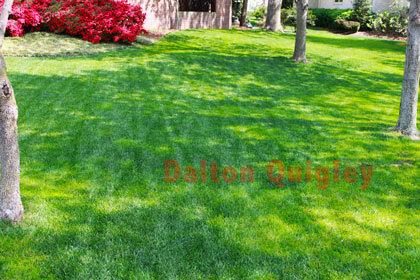 If you have a lawn in the Nashville area you should be fertilizing. Fertilization gives your turf grass vital nutrients it needs to live a healthy life. Fertlizing helps your plants have a healthy immune system and a great green color. Nashville Lawn Fertilizing image, this image shows two comparable lawns with different outcomes depending on if the yard is sprayed with a fertilizer mixture commonly used here in middle Tn. Granular fertilizers can be purchased or you can hire someone to spread a granular fertilizer for you. The rate of Nitrogen, Phosphorus, and Potassium will vary depending on the time of year and overall weather. Some granular fertilizers can be purchased with pre emergent already mixed into the bag. 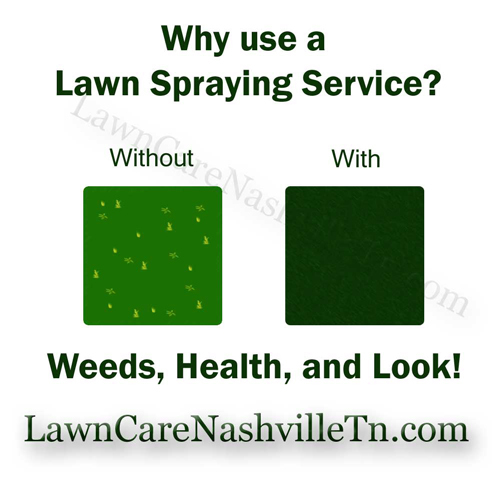 There are many companies that offer the service of spraying fertilizers on local Nashville lawns. This is a tightly regulated industry because of the risks posed when a fertilizer is liquified and airborn in residential areas so use a professional if you decide to go this route. Lawn spraying companies pricing tends to be really affordable because of the way the plant absorbs the nutrients instantly but this process has to be done more often. Most lawn spraying companies chemical mix tend to contain a chemical for broad leaf weed varieties like White Clover, Chickweed, Dandelion and Henbit. The ultimate fertilization application is to have healthy soil where the organisms release enzymes and other nutrients into the soil and around the root area of your grass simply by living out their lives. If you want this type of fertilization you will need to look into products that boost your beneficial organism activity. Healthy soil helps you to have healthy grass plants. You can find these types of products at the local mom and pop nurseries near your home, please use them and you will be helping local families in your area. What is aeration and do I need it? 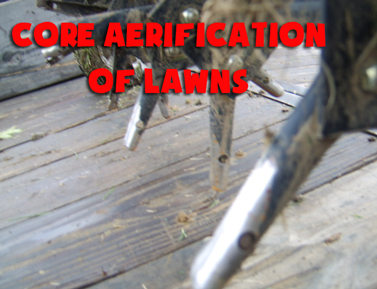 Posted in Uncategorized | Comments Off on What is aeration and do I need it? Why should a lawn area be aerated and what is aerification? nurtients from below and deposits them on the surface while making a hole airborn nutrients can get into to satisfy your plants nutrient needs. Some properties may never have the lawn they could have if they are not properly aerated. There is another popular method called ground slicing. When ground slicing is performed an attachment is usually towed behind a motorized riding machine. There are blades that slice the ground on a 45 degree angle which oopens up the soil to airborn nutrients, in many years of experience I find clients prefer the results from core aeration. I do believe both are beneficial and have benefits. What time of year should I aerate? You should aerate when the soil is not soaked with water or too dry. The time of year does not matter when aeration is performed but many people choose to aerate at the time of seeding to have the additional benefit of seed falling into the new holes where it can germinate faster because of warmer ground temperatures and a more moist environment. In the Middle Tn Nashville area aeration is recommended at least once a year. If you aerate at the time you seed a place is created that allows the seed to germinate better. The ground temperature is typically warmer than the night air in Spring and Fall so aeration provides an opening into those warm moist conditions seed loves. Consider Aeration when seeding and if you don’t seed because of the type of grass you have then you should still aerate to improve your turf grasses health. Aerification of your lawn has the benefits of giving the roots of your turf oxygen, and other important nutrients, reduces compaction, and can make a place for seed to germinate faster. Now that you know what aeration is and the different common types I need to tell you that yes you need it. I hope you consider core aerification for your yard this year. If you are seeding and aerating you should learn about protecting grass seed from cold temperatures using this method. Here are some ideas that will help you reach a conclusion as to whether do the lawn work yourself or hire a professional. A well-kept lawn is the result of hard work and several hours spent mowing, trimming, the edging grass and hedges. However, all that hard work and long hours are things you can either do on your own, or pay a professional to take care of for you. Going the do-it-yourself route or hiring a professional lawn care provider is a choice many homeowners ponder upon, especially those who already know the difficulties of caring for a lawn on their own. Lawn care is of course, not a rocket science, but it’s not a simple affair either—it’s easy to assume it’s all just mowing. Perhaps the biggest benefit of going the do-it-yourself path is in how it allows you to develop a keen understanding of what it takes to care for lawns. Things like sod or grass types, fertilizer choices, and frequency of fertilizer application often don’t get the attention that they should, and going DIY helps you gain a better appreciation of these factors. Another benefit of going DIY is that it can often turn out cheaper for you over the long run. Sure, you’ll probably get off to a bumbling start, making costly mistakes and needless purchases for your lawn maintenance, but again, as you develop a better understanding of your lawn, you get to make more informed, more personal decisions on your lawn’s care. Hiring a professional is easy, quick, and simple. Of course, it doesn’t come cheap, but for many homeowners, hiring a professional lawn care provider is the most practical thing to do. After all, not everyone has time to spend hours researching and practicing the craft of lawn maintenance. In addition, many people don’t care much for a hands-on approach to things. Just remember that when hiring professionals to care for your lawn, the cheapest offer isn’t necessarily the best. Some person who claims to be a ‘pro’ may just be a laid off worker who decided to borrow his neighbor’s lawn mower and distribute flyers to advertise his services. Needless to say, you don’t want this guy all over your property. Always make a background check on service providers in your area and investigate your options carefully. Don’t let cheap rates be your priority in this situation—you want quality, not sloppy work. If you can make the commitment to spend time to learn and work on your lawn properly, doing it yourself can be a fun way for you to get an intimate idea on lawn maintenance. If you can’t, you can have a manicured lawn by paying the professionals to take care of things for you. Thank you as always for visiting us to get great gardening tips . 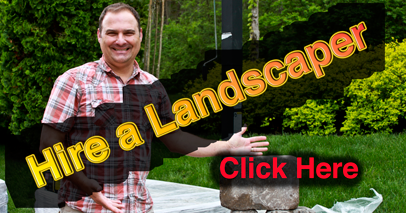 If you decide to hire a lawn care professional you should see this page. Grass seed needs a little blanket to keep warm! Posted in Uncategorized | Comments Off on Grass seed needs a little blanket to keep warm! Grass seed needs a little blanket to keep warm and moist to become a plant. No matter what kind of grass you are going to use preparation is key to having a great lawn. Grass seed needs to stay moist for a certain amount of hours to germinate. Each type of grass seed has a different amount of time and correct temperatures to germinate. Imagine you have thrown a hand full of your favorite grass seed down on the soil and are waiting to see plants. If it does not rain that day do you think the seed will stay moist? Probably not. A grass plant makes seed for the next years seedlings to grow so it puts a barrier around the seed to protect it, if soaked in a moist warm environment the seed will open. Box store seed may be less effective from sitting over time. If you buy grass seed from off of the shelf of a Big Box store it has probably been there a while and a good portion of it is not going to germinate anyway so you need to get the most out of the seed that is alive. The grass seed is kept dry on the shelf so that it does not germinate. Once you have bought your seed and are ready to spread it think about making a warm moist blanket over your seed. Some lawn care professionals, landscapers, and gardeners use wheat straw over the grass seed. The straw helps to hide the seed from birds and provide a little bit of a barrier from drier air and night time cold. Straw is a good cost effective choice for most instances. Straw can be bought at most places that sell Mulch. Soil as a protective layer over seed. I like to use soil to make the best barrier. Once the soil is wet and over the seed it will hold moisture for a long time while providing a mild amount of nutrients which the seed craves.To make a soil barrier over your seed you first must spread your seed over the prepared area. Next take a rake and rake the soil over the top of your seed. Once you do this you will have a barrier from birds feasting on your seed as well as trap air, water, and other nutrients. A mild fertilizer right after covering the seed will provide a great boost. You can buy fescue grass seed at local Nurseries. Compost fertilizes and makes a great protective layer. The last option I am mentioning is to compost seed. Compost seeding is where you cast your seed over the prepared area and then spread a 1 to 2 inch layer of aged compost over the top of the seed. Aged compost won’t heat up while on top of the seed. The compost acts as a warm moist blanket and fertilizer which will make your grass seed germinate fast and give it nutrients for a long time to come. Just use something as an insulating barrier from temps. Grass seed needs a warm, and moist area to germinate. Stores carry seed that is very dry and needs moisture over a period of time to germinate. Lawn Care professionals agree that a protective barrier is needed from birds. Straw, Soil, or Compost could be used to cover the seed and provide the needed protection and moisture. Depending on your budget now you have 3 choices to start your new seed. One way to increase the success of your seeding is to aerate! How to remove crabgrass from your yard! Posted in Uncategorized | Comments Off on How to remove crabgrass from your yard! How do you remove crabgrass from a yard? How to remove crab grass from your Nashville yard has been a difficult topic for lawn care pros for a long time. Crab grass can be removed a few ways and also prevented for the most part. Controlling this agrivating pesky grass can bring some satisfaction. Crabgrass is already in your yard! Crabgrass is a common weed grass found in lawns across the Southern United States and Nashville is no exception. Crabgrass invades by air born seeds that wait dormant in the soil until the heat of Summer germinates them. Even fresh sod can get invaded by Crabgrass. Once a crabgrass seed germinates it becomes a plant that makes a stringy root system that is hard to remove by hand. If you pull the plant it is likely to break and leave enough root system to make another one just like it. The problem comes in where this plant will grow big enough to seed and make more of itself very fast. Then the problem is multiplied a thousand times as your yard becomes a field of crabgrass. Hand pulling this weed usually only removes one plant but doesn’t stop the thousands of others from invading. There are chemicals that control crabgrass but they must be applied early in the process of growth of the plant and again a couple of times during the season to keep it under control. Chemical Companies like Green Scene of Nashville will come to your home, evaluate your weed problem, and design a program to get these pesky plants under control.You must get control early in the season with pre-emergents. Pre-emergents are chemicals that prevent the crabgrass seed from germinating in the first place and so this should be applied before the temperatures become hot enough for germination. Lawn Spraying Companies apply fertilizers early in the growing season, a pre-emergent is mixed in to control crabgrass then so you get a jump on the season and hopefully prevent most of the problem grasses from ever existing in the first place. No weeds = no new seeds to spread the weeds and therefore you get the lawn you want. 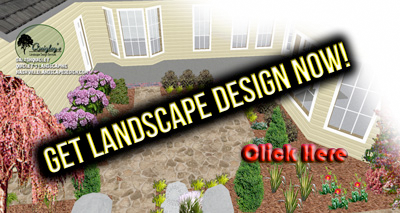 Do you need Mulch, Soil, Stone, Landscaping, Landscape Design, a Nursery, or Tree Service? Crabgrass is a problem all across the Nashville and the rest of the southern United States and it can be controlled. Pulling this weed doesn’t work for a whole yard but there is a remedy. You are going to fertilize your yard anyway in the Spring so why not have a company spray the yard and get the benefit of Pre-emergents to prevent the weeds before they become a problem? Your yard will thank you and your neighbors will comment on your mostly weed free yard. What is a lawn service?